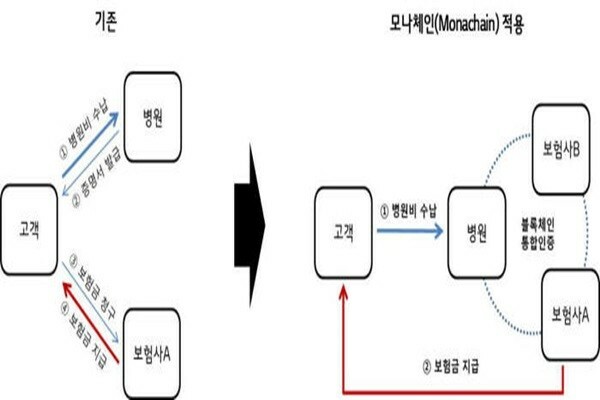 LG CNS made an announcement on the 13th that it will be launching its blockchain platform ‘Monachain’. Monachain is an industrial blockchain platform that can be applied to all industries such as finance, community, telecommunication, and manufacturing. Monachain is a compound word that combines ‘Mona’ from Mona Lisa of Leonardo da Vinci, who represents Renaissance period, and ‘Chain’ from blockchain. 3 major services that Monachain provide are digital authentication, digital community currency, and digital supply chain management. ‘Digital authentication’, which is Monachain’s main function, is a fundamental technology that is needed to apply blockchain to all industries. Monachain needs to secure trusts from participants through authentication to become an industrial blockchain. LG CNS utilizes DID Decentralized Identifier technology to provide a differentiated digital authentication service. DID Decentralized Identifier technology is an international standard of W3C that has about 500 worldwide organizations participating. ‘Digital community currency’, which is based on digital authentication, creates a digital wallet within a personal portable device and issues digital gift certificate. LG CNS is currently working with nationwide commercial banks to prepare its digital community currency business. LG CNS provides its blockchain platform to banks while banks are in charge of issuing and distributing community currency. ‘Digital supply chain management’ shares various information such as information on transactions that occur between production and delivery processes fast and transparently. It is effective in cutting time required for production, maintaining optimum level of inventories, minimizing errors in transport, and reducing costs. LG CNS made a partnership with world’s biggest blockchain consortium ‘R3’, which specializes in finance, at the end of May of last year to secure global level of blockchain technology. It joined ‘OBCIA (Open Blockchain Industry Association)’ in April and it is planning to participate in a global blockchain development project called ‘Hyperledger’ during the first half of this year. LG CNS recently reassigned personnel specializing in blockchain as it newly established a task force composed of 50 employees under CTO (Chief Technology Officer). It is planning to accelerate its blockchain business by increasing number of employees by twice or more. “We are going to focus on creating actual successful examples in various industries by launching Monachain.” said CTO Hyun Shin-kyoon of LG CNS.